Fixing large holes in drywall does not require a $99 per hour handyman from Angie's List. Instead, it is a super DIY-friendly task that definitely falls into the category of "looks harder than it is." If the prospect of buying a 4' x 8' sheet of drywall has been an obstacle, take heart: all home improvement stores and many local hardware stores sell inexpensive 12" x 12" squares of drywall intended just for repairs! 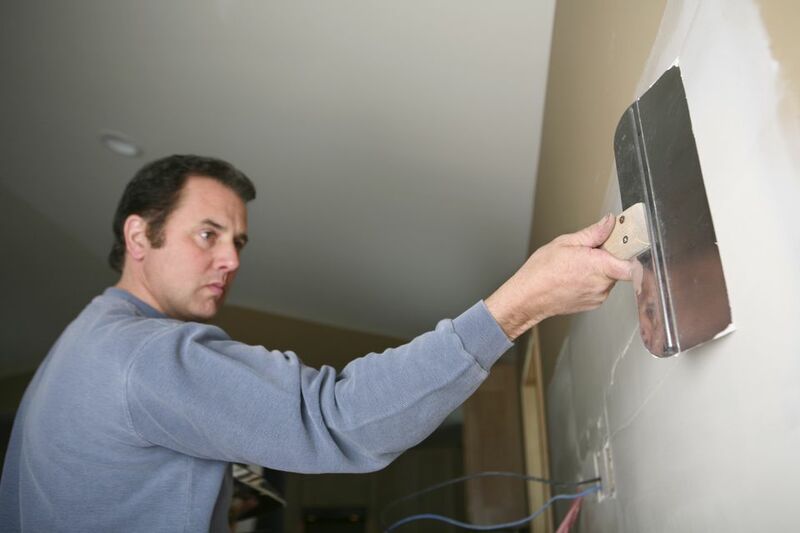 Repairing a large hole in drywall is a completely different process of repairing a small hole in drywall. Small holes essentially just require a dab of goop (spackle or drywall compound), mesh tape, and some light sanding, but big drywall holes need... well, they need more drywall. Square section of drywall exceeding the size of the hole by at least two inches on all sides. Drywall saw (or jigsaw with coarse blade). Drywall joint compound (not spackle). Two strips of plywood or other thin wood about two inches wide. Length of these strips is determined by adding six inches to the diameter of the hole being repaired. Cut away any stray, loose paper parts around the hole to be repaired. If any chunks of drywall are hanging, remove them as well. With the framing square, or simply by eyeballing it, draw a square around the hole. The lines should extend about 1/2" past the edges of the hole. With the drywall saw or jigsaw, cut along the lines of your square. Cut your two plywood strips so that they are three inches longer — on each end of the strip — than the hole (i.e., your newly created square). Insert the strips behind the hole, within the wall cavity. With the cordless drill, drive the 1 1/4" screws through the wall and into the wood strips. Essentially, you are building a framework of these two strips for the new piece of drywall to rest on. With the jigsaw or hand saw, cut your extra piece of drywall so that it exactly fits into your newly created "square hole." Screw into the wood strips. Four screws are sufficient. Apply drywall mesh tape over the seams. At this point, fill over mesh tape with joint compound. Let dry, then sand. Fill in once again, dry, and sand until smooth.